“Prayer Book” Evensong is one of the most precious gifts that the Church of England has inherited from the work of the martyr Thomas Cranmer (Archbishop of Canterbury, 1533-1556). The poetry of the language has moved people for hundreds of years. Evensong is best appreciated when fully sung and the offering of music allowed to envelop the worshipper. 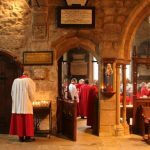 Join us in Choral Evensong at St Oswald’s parish church on the second and fourth Sunday evenings every month except August. If you are new to this service there is guide to follow the Order for Evening Prayer which will be helpful in finding your way around.